I was thrown a challenge: could you cook dinner for $5 or less? And could you share it with other people as part of a potluck dinner? 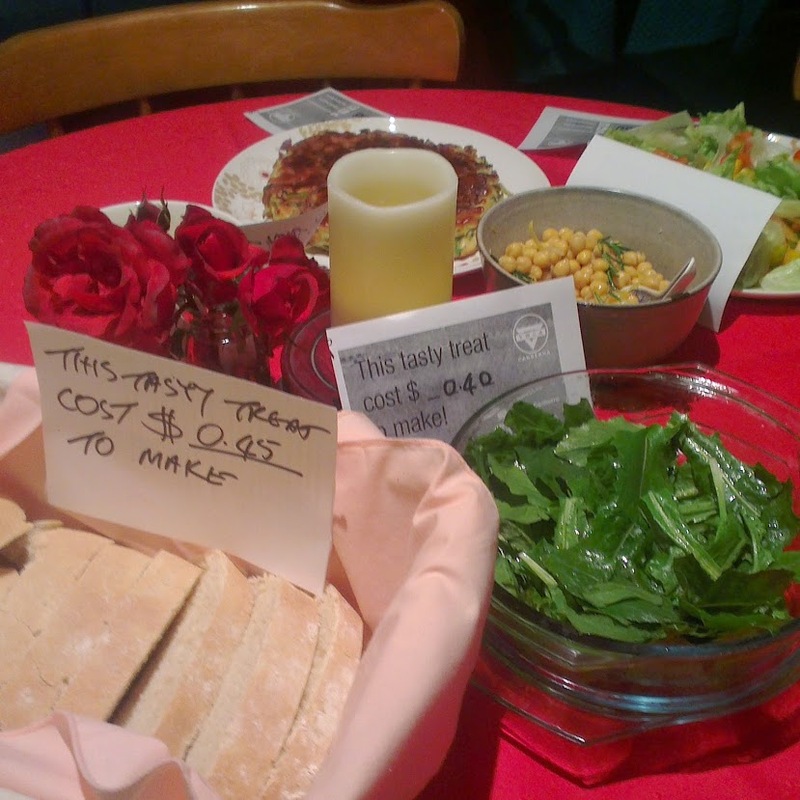 The $5 potluck dinner is in aid of YWCA Canberra‘s winter hub appeal. 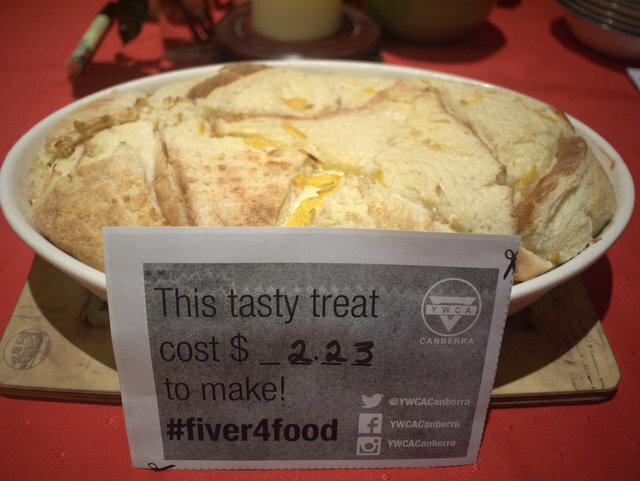 Participants aim to cook a meal for $5 or less, invite friends over, take photos and use the #Fiver4Food hashtag to share pictures. Canberra can be a cold and lonely place when you are struggling to make ends meet. The YWCA operates a Food Hub, a ‘pantry-like system’ that provides young people and their families with food in times of need. And according to the YWCA’s website, it is more than just food: it also provides a community with support. 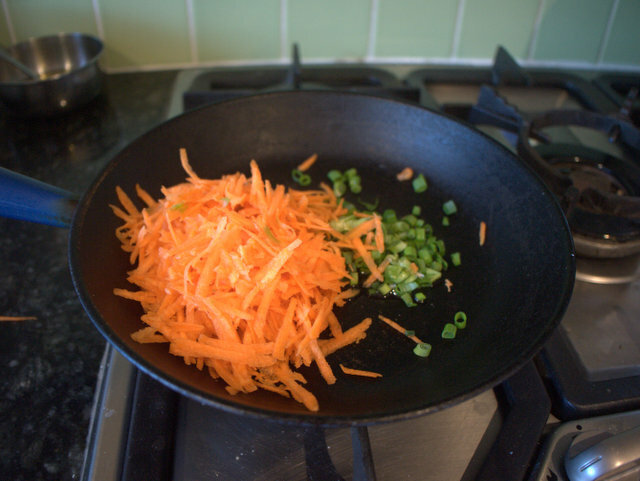 Being in essence frugal, and loving to cook, I was excited about this challenge. And it happens that we are (coincidentally) having a tight month financially, with several major bills due. For us we are blessed by having good jobs and the promise of a fat tax refund soon, but I could not imagine what it would be like to have to choose between food and turning on the gas heater. Or not being able to take the kids to see the doctor. “Making a meal for under $5 is very difficult,” one of my friends said when I invited her. And she and several others politely declined on various pretexts. Perhaps the challenge was too much for most? Undaunted, I proceeded until I had received a ‘yes’ from two couples: so we had three families contributing, spending $5 or less each, or $15 in total. I will admit that hubby was not quite as excited about this $5 potluck idea as I was. Hospitality runs deep in Taiwanese culture. Taiwanese people usually treat friends to lavish restaurant banquets, fighting over the honour of who would pay the bill. And if you are invited into someone’s home, they will usually over cater. While the Taiwanese expat community here in Australia is more relaxed, in Taiwan it is considered an embarrassment — a sign of lack as a host — to ask a guest to bring something. Much less something cheap. So hubby went shopping in the afternoon and bought some potato chips as a back-up just in case. “How much did the chips cost,” I asked? He looked sad, as did Big A who was had seen the packet and was looking forward to eating chippies. Was I a mean mummy? Possibly. But by the end of the evening, after we had feasted like royalty on NINE dishes that cost a total of $12.99 to produce, he was no longer a skeptic. It can be done. I made seven dishes for a grand total of $4.49. My neighbours brought two Japanese-themed dishes totalling $2.50, and our other friends bought a hearty meal that we ate as leftovers the next day that cost only $6. 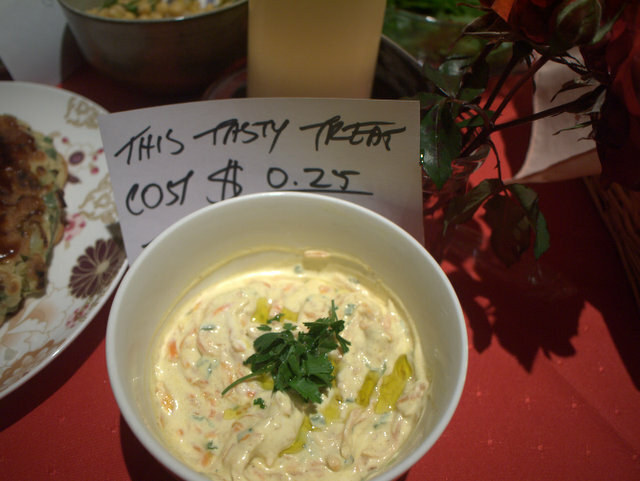 Middle-eastern style carrot dip, made with home-made yoghurt and home-grown shallots (I saved the ends from store-bought shallots and replanted them) (25 cents). I costed in coriander, but this was gifted by a friend who was heading off to be a grey nomad. Chickpeas marinated with lemon, Canberra extra virgin olive oil, garlic and rosemary (45 cents). 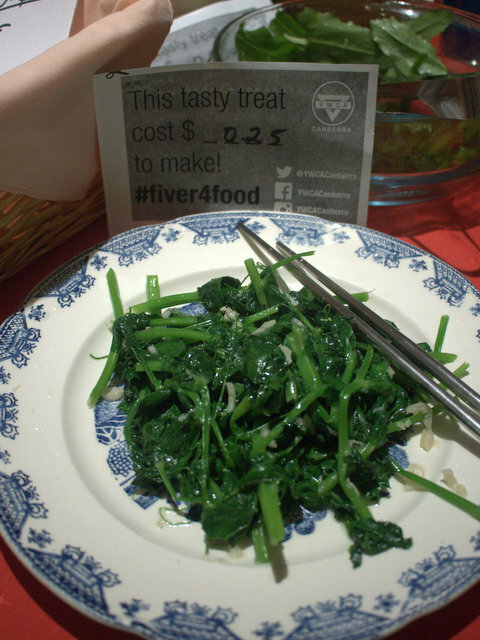 Stir-fried snow pea shoots with garlic (25 cents). In Australia we usually only eat the snow peas, but in Chinese cuisine the tender shoots are a delicacy. I sourced these from my garden — one of the few things doing okay in my long-neglected vegie patch. Dandelion salad with extra virgin olive oil and lemon dressing (40 cents). 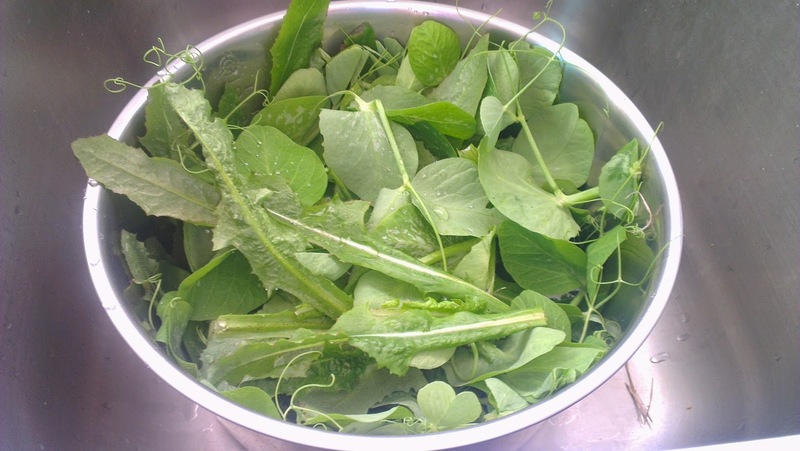 The dandelion leaves were harvested fresh from my backyard. This common backyard weed is a veritable superfood, with an encyclopedia of health benefits. Yes, hubby was shocked that I served our guests weeds. But they liked it, and ate it all up. Especially my Japanese neighbour. 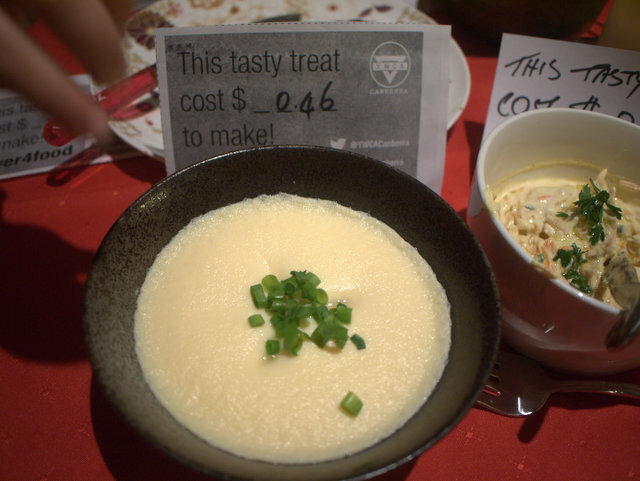 Steamed savoury egg custard (46 cents). Hubby made this, a favourite with our kids since they were babies. It is incredibly fluffy, and has that homely comfort-food factor that restaurant food can never replicate. Lemon-scented bread and butter pudding ($2.23). A classic for good reason. 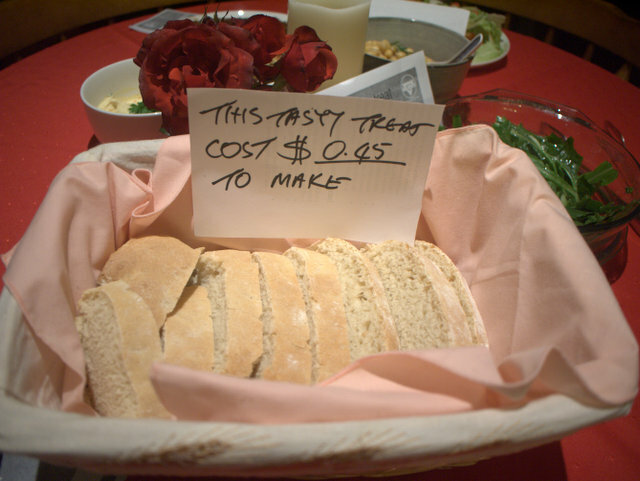 I costed in half a loaf of supermarket bread, even thought it was stale bread that many people would throw away. 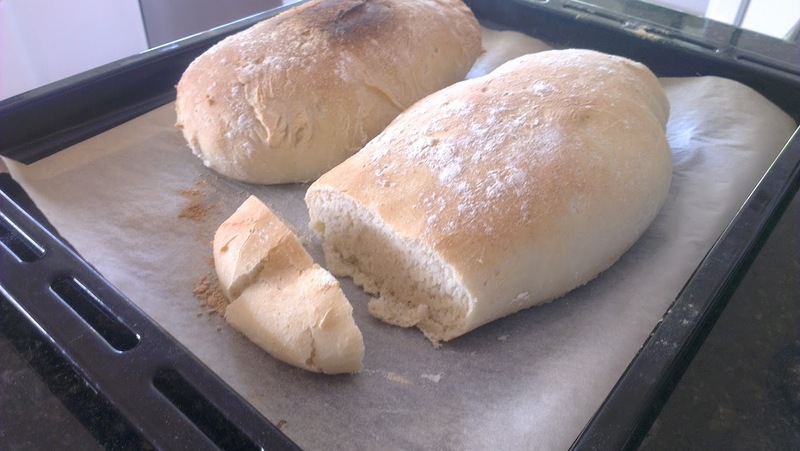 I could have made it more cheaply with the homemade ciabatta, but it was still too fresh. I thought about using jam, nutella or vanilla but it would stretch my budget. My Japanese neighbour and her husband surprised us by showing that Japanese food does not just consist of high-end sushi restaurants. 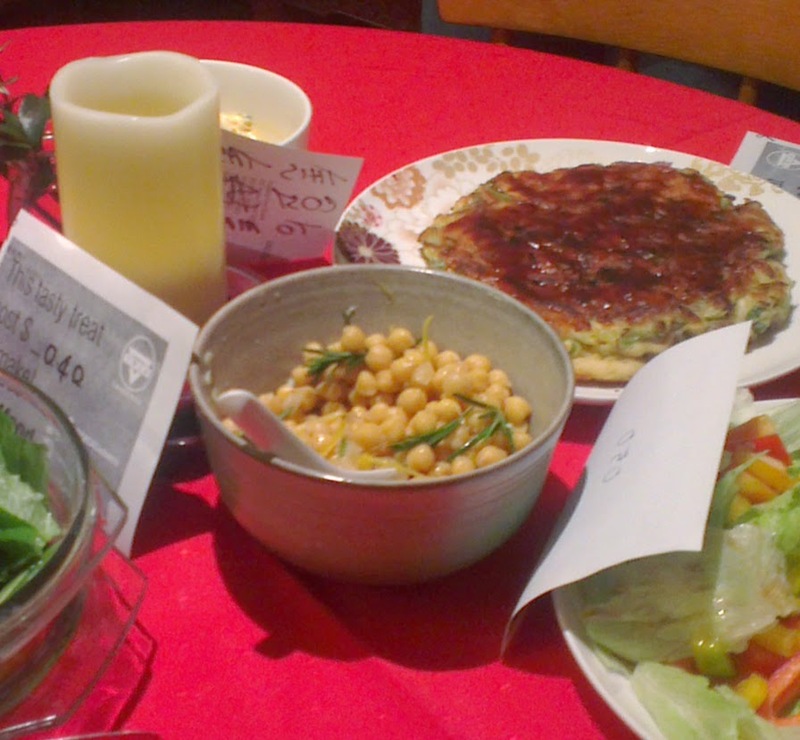 And in fact, home-style Japanese food can be cheap and delicious. When she was a student in Australia, her budget was so tight that she only spent $10 a week on food. So she knows how to cook low-cost meals. 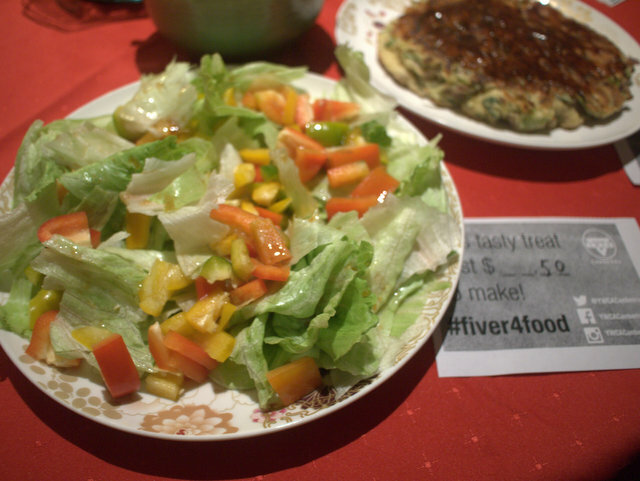 She produced a crunchy salad with a Japanese dressing for less than 50 cents. 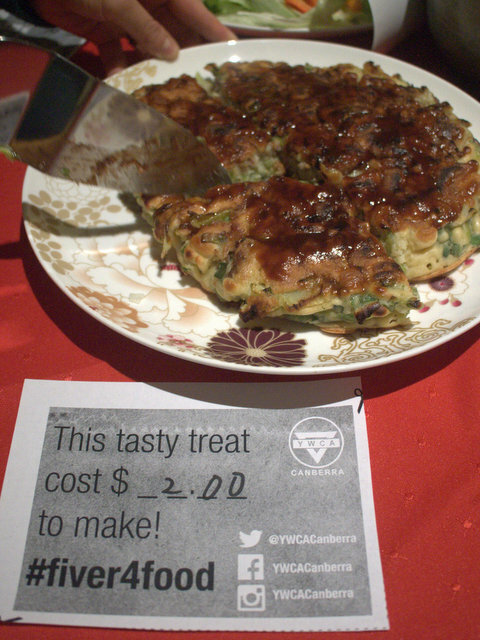 Then a dish of Japanese okonomiyaki — a type of thick savoury pancake — cost only $2.00. We all clamoured for slices. She has a secret recipe for making this especially cost effective, which I promise to share later (I will need to do a taste test run first). Our friend Rose baked this, which was hands down hubby’s favourite. (Yes, he chose this dish over his wife’s cooking). Little A loved it, too. 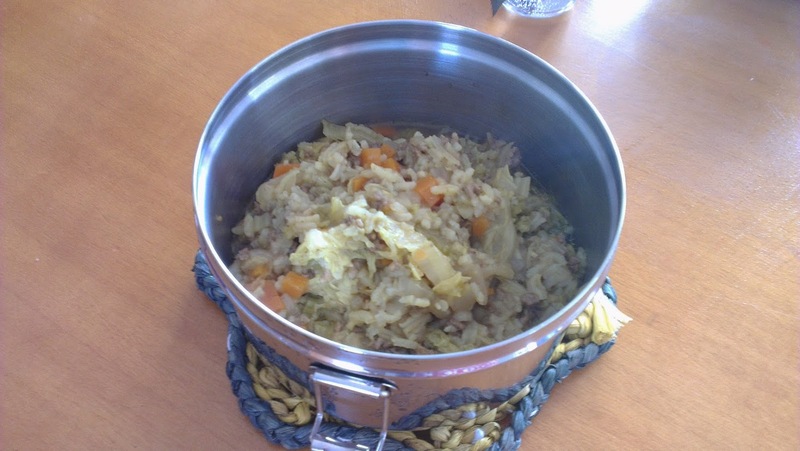 Curry mince casserole, a meal in itself with rice and vegetables. 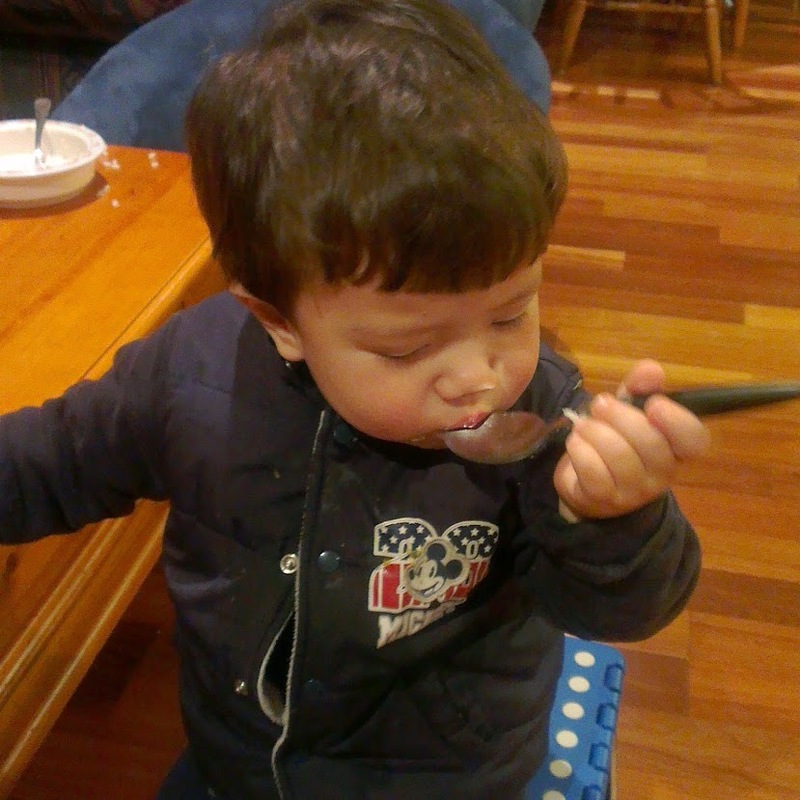 Although it went over the $5 challenge, it was a big meal and more than fed our party of six adults and two children. And then we enjoyed the meal again as leftovers the next day! So, who wants to come over for the next $5 potluck dinner? I still have lots of budget ideas to try out. 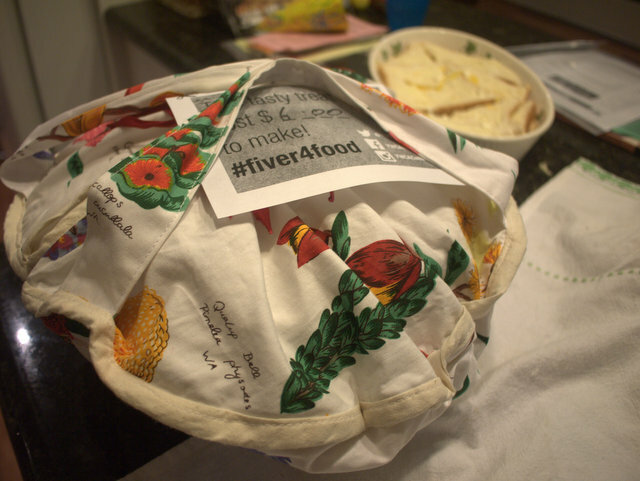 And in support of this #Fiver4Food campaign, I will be blogging about frugal food ideas over the next few weeks. So stay tuned for more cheap food ideas. Great cooking Serina, what a great result to this challenge! Serina, this is a great post! Thank you so much! I’m so glad to see bloggers getting into this really important YWCA initiative on a really important (and scary) issue. Yes, food security is a scary issue isn’t it especially now that winter is really upon us. Are you participating in the $5 potluck challenge as well? If so, I look forward to seeing what you come up with! You have me tempted Serina. I probably spend about that much on meals anyway. I’m kind of at risk of needing to use the Food Hub more than anything else. But I too am very good with frugal cooking, and have taken to foraging for edible weeds for my leafy green intake so I was glad to see your dandelion salad. I have a chronic illness which makes socialising difficult, but I’d be interested in joining a pot luck if you were host another. I also think the whole campaign is a great initiative. HI Susan, I was a bit scared to try the dandelion foraging. I did a lot of internet research to check I was choosing the ‘right’ kind. 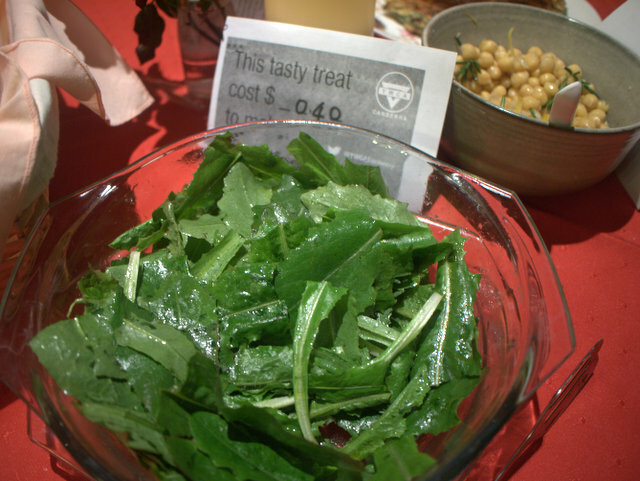 I rmember reading in a macrobiotic cookbook years ago about a Japanese lady who went on picnics with her kids in the springtime and foraged for fresh weeds. Sorry to hear you are unwell: sending you wellness wishes. Hope you get better soon. It must be hard not being able to potter around in the kitchen. This challenge was a lot of fun. Thanks. Are you up to the challenge as well? It is amazing what creative dishes people can make.